It was a pretty good death, though. There's no word on where this image comes from; Mark found it on imgur and of course immediately sent it to me, because how could he not? Looking at that thing, my arteries are clogging and I can feel my life force slipping away, and yet I can't pretend I'm not desperately compelled to eat one. 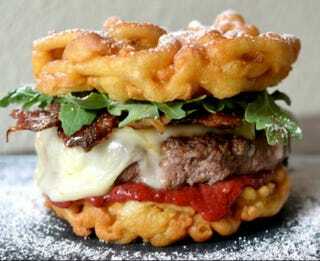 Possibly my favorite touch is the arugula — I mean, you can't use iceberg lettuce on a funnel cake burger, we're trying to be healthy here, for God's sake. This isn't the only source of a funnel cake cheeseburger (because of course it wouldn't be). The Wisconsin Timber Rattlers, the Class A affiliate of the Milwaukee Brewers, has recently introduced a similar concept (they're also debuting a grilled cheese bacon cheeseburger, which...pretty much just sounds like a pan-friend bacon cheeseburger using a different kind of bread?). Of course this would happen in Wisconsin, maybe the only Midwestern state* with the nimbleness to steer into the culinary skid and turn horrifying unhealthiness into something equally as beautiful. There are also commenters on the imgur post claiming this has been at the Wisconsin State Fair for years, although I couldn't find any photographic evidence of this. It wouldn't shock me either way. * Chicago gets a pass. Obviously.